Christmas may be a hazy, food-coma hangover, but that does not mean pastry season is over. Indeed, today we have entered King Cake time, the weeks between Epiphany and Mardi Gras–the last night before Lent and its prescription of 40 days of restraint. In the United States, New Orleans has made King Cake synonymous with Mardi Gras. Named for the visit of the three Magi to the newborn Christ child, the cake comes in so many variations that one needs a few weeks just to fully enjoy them all. 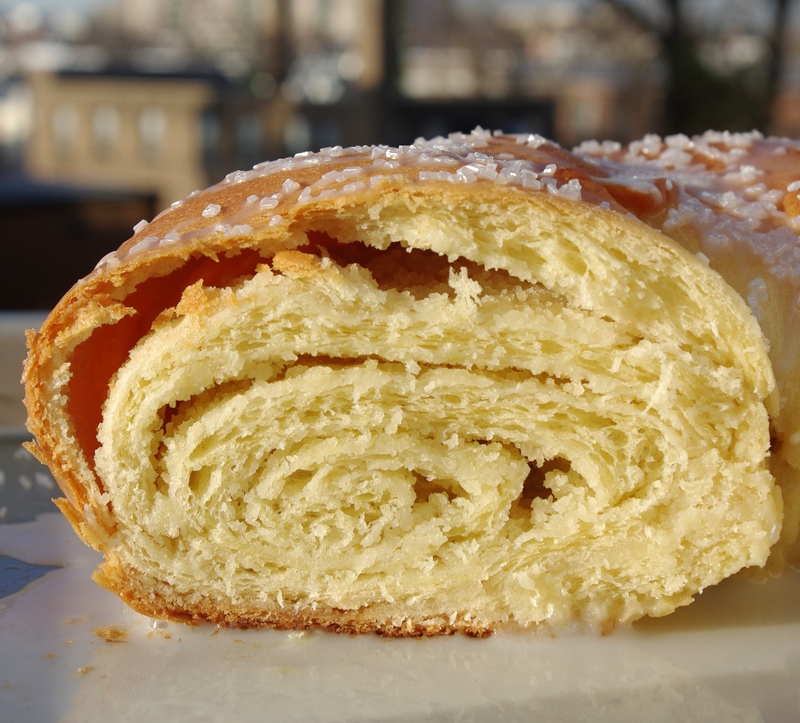 It can take the shape of a cinnamon-scented ring of bread sparsely dotted with candied fruit (Spain and Latin America) or an almond-paste-filled circle of layered puff pastry (France). One commonality is a buried trinket–a plastic or ceramic baby figurine or a dried bean to symbolize the infant Jesus–which bestows various honors upon the person who gets the item in her or his slice. Mexico, where I first encountered the bread, has my favorite tradition: The person who wins the baby has to make tamales for everyone on Candlemas, February 2. Mexico’s cake, rosca de reyes, is a vaguely sweet yeast bread (akin to pan de muerto), formed into a ring and finished with a sugar topping that may also include candied fruit and/or nuts. It is tasty–and lovely with a cup of coffee for breakfast. However, I like my desserts sweeter and have long been drawn to the French version (galette des rois) and its layers of sweet almond filling. So I pulled together a hybrid to celebrate Día de Reyes, a basic sweet dough filled with a rough almond paste, rolled like cinnamon rolls, shaped and baked into a ring, and glazed when cool with almond icing. I just might call it a rosca des rois. Looks gorgeous and I bet tastes even better than it looks!